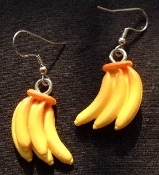 Mini BANANA BUNCH EARRINGS - Realistic Garden Fruit Costume Jewelry - Miniature Resin Jungle Rainforest Tree Monkey Food Charm, approx. 1" long. Have some banana-boat fun. Day-O, Day-ay-ay-o, Daylight come and me wanna go home!